West Bengal JENPAUH 2nd Round Seat Allotment Result 2018: West Bengal Main Computerised Counselling (WBMCC) has declared the 2nd round allotment results on 25th September After 5 PM. Hopefuls who have taken part in the counseling and choice filling rounds till 28th September can check the JENPAUH Seat allotment result (2nd round). Candidates can visit the official portal, wbmcc.nic.in to check the seat allotment list. After going through the seat allotment list, candidates allotted admission will have to download JENPAUH allotment order and report at the allotted colleges during 28th September to 03rd October. 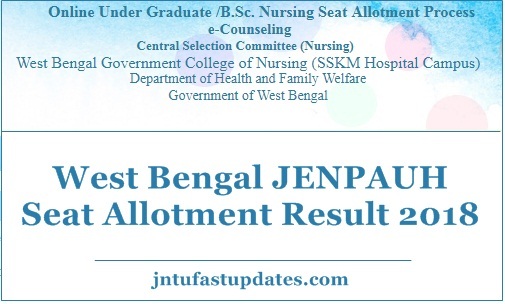 Aspirants who have come across the West Bengal JANPAUH examination, counseling, choice filling rounds can check more details of WB JENPAUH Seat Allotment schedule, reporting dates, and other details from the following article. Candidates who have attended the WB JENPAUH Counselling process from 13th August to 19th August and attended the choice filling/choice looking rounds can now check the seat allotment result from the MCC official portal, wbmcc.nic.in. Candidates allotted admission in 2nd round allotment will have to report at the allotted colleges from 28th September to 03rd October 2018 (10 AM to 4 PM) (As per server time). And hopefuls who do not get the admission in 1st round seat allotment need not worry. They can wait for the 2nd round seat allotment results, which will be released by WBMCC after the 1st phase of the admission process is done. Provisional Seat Allotment Result – Round 2 is Released. Check Below Link. WB JENPAUH seat allotment list will be displayed on the screen. Check the result and download seat allotment order to report at the allotted college. My bsc nursing rank 2125.. May I get admission in any private collage..
Sir my bsc nursing rank 2125. May I get admission in any private collage..
Si/mam, my bsc nursing rank is 6169 and my sc rank is 834.sir/ mam may I get any private bsc nursing clg in Kolkata. Please sir/mam please reply me.i am very interested to get admission in bsc nursing . Sir amer b.sc.nursing rank is 6451 and OBC B rank is 972.can I eligible for admission in college? Please reply me? Sir ,my b.sc rank in nursing is 5884 and my OBC-B rank is 893 ..so, may I get admission in any government or private collage?? Sir ..please reply me ..
Sir, my bsc nuring rank in jenpauh is 4785 and sc rank is 623….Sir, so i have any chance in nursing, government or privet ? My rank is 8268..May I get any private College in bsc nursing 2018?